Struggling to make ends meet? These four tips will help you save money on a tight budget and create a bit more wiggle room! I remember well the lean years when we were first married. Those were the days of agonizing over where we were going to spend every single penny. The days of doing without a lot of things and working long hours just to try to get ahead. And even so, there were often weeks when we wondered how we were going to eek by. I don’t really regret those years, because they taught us a lot and helped equip us to survive these somewhat lean years that we are again experiencing while my husband goes back to school. Even so, although they were necessary, those extreme penny pinching years weren’t exactly fun! Maybe you find yourself in a season where you are trying to eek by on an extremely tight budget. If so, chances are you are like us and desperate to find ways to try to give yourself a little bit of financial breathing space. I have good news for you! There are several fairly simple things that you can do to give yourself a little boost or wiggle room. You know the saying, “One person’s junk is another person’s treasure”, right? Well, there is a really good chance that if you look around your house a bit, you’ll be able to find some things you are no longer using that you could sell and make a little money on. An added benefit is that you’ll get to enjoy a more de-cluttered home too! How is that for a win-win: extra money for the bills and a more relaxing space to live in! It’s so easy to think that we need something when in reality it is truly only a want. Our culture has conditioned us to think that we deserve to have everything and that shouldn’t have to do without. But guess what? You might be surprised to find that you can actually do without a lot of things, and still be quite content! Take a good look at the things you spend your money on. Do you really need them or could you do without and use the money that you save to give your budget a little more wiggle room? And if giving something up permanently sounds too difficult, maybe you would be willing to do it just temporarily until you get ahead a bit. Cheese- When we were first married, we pretty much never ate just plain cheese. I used it some in cooking but even though we both love it, we learned to do without it just fine. We actually eat more cheese now than we ever have, but we still don’t eat it a lot just because it can quickly get expensive and with a $200 grocery budget, there’s not a lot of room for splurging! Cellphone- My husband didn’t get a cellphone until last year when we discovered a super inexpensive cell phone plan. It would have been handy for him to have one before that, but he didn’t truly need it. Nice Cars- We’ve always driven older vehicles and often they have been kind of on the ugly side too. But they have always been 100% paid for and mostly dependable, so we figured the savings made it worth it. Eating Out- We pretty much never ate out during those first years of our marriage unless we were given a gift card that would cover our expenses. And actually, even though I especially really enjoy dining out, we still rarely do it just because it is such a quick way to blow through money. It’s so easy to think that spending an extra $0.50 for a piece of candy or $1.00 for a coffee isn’t that big of a deal. And really, $0.50 and even $1.00 isn’t that much. But think about it this way- if you spend just $1.00 a day on coffee, over a year’s time you lay out $365 for that cup of joe! Those little expenditures do add up and it is a good idea to be mindful of them! This whole small savings principle can be applied to so many areas of your spending. When you go out to eat, skip the beverages and get water instead. You’ll save money and it’s healthier too! At the grocery store, take a couple of extra seconds and scan the shelf to see which brand truly is the cheapest. Don’t just assume the store brand is the least expensive because sometimes it is not! And speaking of grocery store savings, these easy-to-use money saving apps are one of my favorite ways to save on groceries and household supplies. Many times they even offer savings on any brand of a product such as milk, bread, fruit, diapers and more! 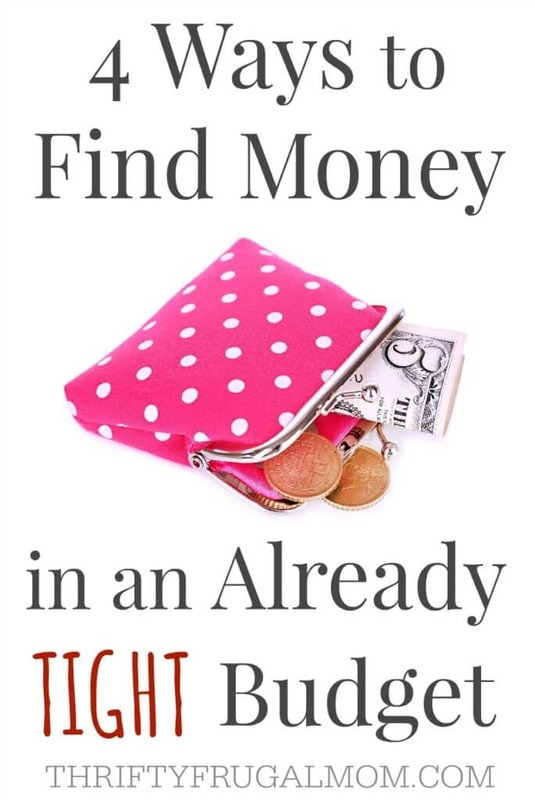 Sometimes it can feel hard to even know where to start looking for income earning opportunities, especially if you are already working a full time job or are a stay at home mom taking care of your kids all day. Often though, if you get creative, you can come up with something. Are there hobbies you have that you could turn into a business venture? What are you gifted at doing? Do you love to bake? Maybe you could sell baked good at a local coffee shop. If you enjoy children, you could start babysitting. Know how to change oil? You could do it for friends for a small charge. Need more ideas? Here’s a list of 10+ easily doable side hustles. And if you have just 5 minutes a day, here’s a way that you can earn $20 a month! What ways have you found to save even when money was tight? Share them with me in the comments below! Great post, you make some really good points. I have decided to declutter my house and do a garage sale or put some unwanted items on eBay. I really like what you say about "Define Wants Versus Needs" I think we often want much more than we need. I hope you can sell your stuff easily! It always feels like a win-win when I can declutter and sell the extra stuff in the process. And yes, I'm convinced most of us have way more than we really need. I've been convicted of that a lot lately and want to continue paring down our things. It's amazing how much you can make from decluttering! And it's such a good feeling to see the money add up while also freeing up space.